I realise that there haven’t been as many blog posts about the 3 weaners this year when compared to the 2 Tamworths we raised last year. This is no reflection on the current trio who I have to say are equally as entertaining as the original two. However it’s more a reflection on the lack of time in each day for everything that could be done. It seems a shame to wake them! Now seems a suitable time to add a brief update on their progress and also outline the plan for the next phase. According to my estimate the pigs have reached 22 weeks now and should be ready to take off to slaughter around the second week of August. I’ve used the best figures I could come up (they don’t stand still for long!) and as luck would have it two of them were pretty much the same size which helps a little. Unfortunately the measurements are only very rough because it’s a little harder to do that accurately when there are 3 pigs and the 2 that aren’t being measured are trying to eat your wellies or your trousers! As with the first set of weaners we haven’t given the pigs “pet” names but for convenience they are identified by the colouring on their back legs as mentioned in an earlier post. 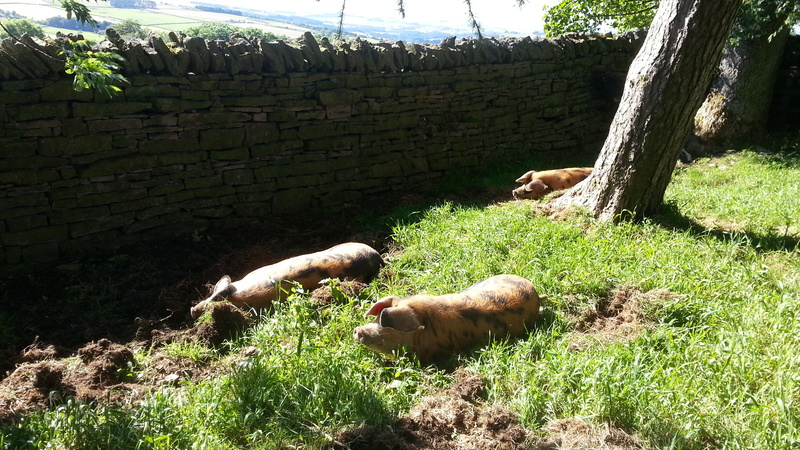 My understanding is that they should be between 60-70Kg live weight by around 6 months old because they are a slower growing rare breed and particularly considering that they are outdoor reared pigs. Based on these figures everything seems to be going according to plan so far and they look to be on course for the target weight by the due date if all goes well. There are a few more steps to negotiate before we can crank up the sausage making machine again so now is the time to do the planning. It’s better to make the plans now rather than when we return home after collecting 3 pigs worth of pork from the butchers! 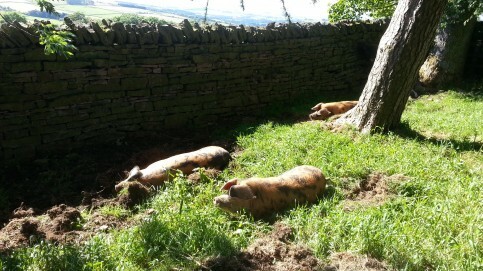 No doubt there will be some outdoor reared, free-range, rare breed pork available for sale at very reasonable prices in due course! « Small Plot Big Ideas in print again!